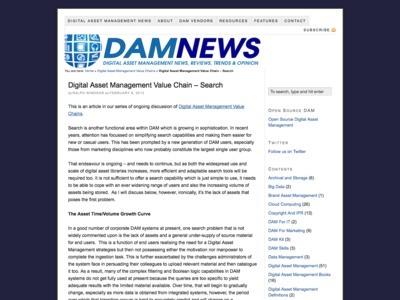 “It is not sufficient to offer a search capability which is just simple to use, it needs to be able to cope with an ever widening range of users and also the increasing volume of assets being stored. […] When end users start to utilise these more sophisticated facilities to filter results for a real world task, they find they are inadequate or have some functional limitation that was not fully anticipated during the design phase. Many developers reading this will be familiar with scenarios where they build a feature, deploy it and then hear nothing until it eventually gets used (sometimes years later) when the real usability issues get reported.